Is my hardware acceleration enabled? 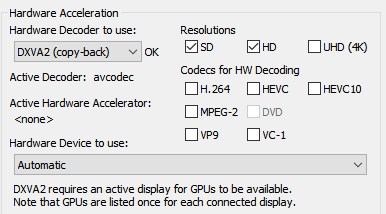 i have enabled DXVA2 copyb-back but the label "Active Hardware Accelerator:" still display "None". Re: Is my hardware acceleration enabled? You must enable the checkboxes below "codecs for HW decoding". That card is pretty old and only supports H.264 / VC-1 / MPEG-2.